These soft Swedish saffron buns are made a little healthier with 100% whole grains and come with a dairy-free option, too! I’m teaming up with Red Star Yeast today to bring you another Swedish Christmas recipe. With St. Lucia, a Swedish holiday, coming up on Saturday, I thought it’d be the perfect time to share these saffron and cardamon spiced yeasted buns. 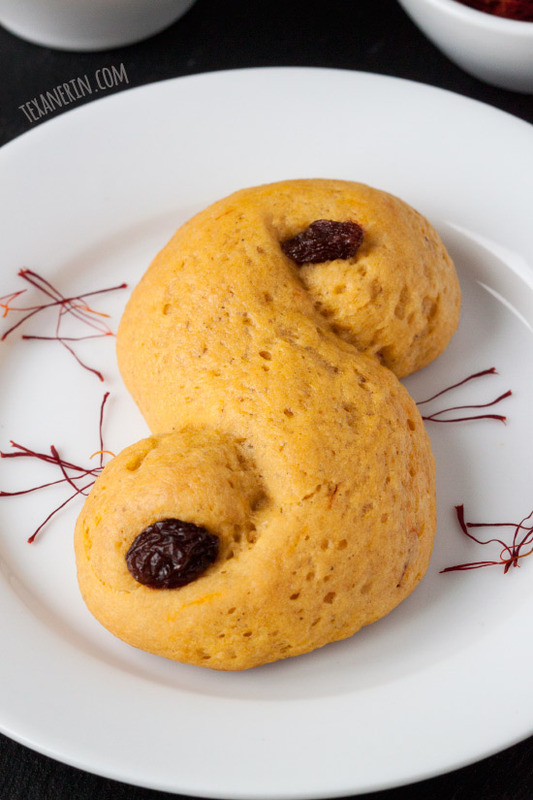 The first few times I was offered one of these saffron buns in Sweden, I politely declined because I thought they sounded and looked weird. They are different, but in a good way. I was actually St. Lucia at my school’s Lucia procession during my exchange year in high school. I had the white gown, red sash and a crown of candles that stole my oxygen. I felt like I was going to faint after the first 5 minutes and friends told me afterwards that I looked like a ghost. It wasn’t a great experience but afterwards I ate these buns, also called lussekatter, and pepparkakor, which made me feel a little better. Ground saffron is generally sold in .5 gram sachets in Sweden for about $3.75. In Germany, .5 grams of saffron costs $20. There was no way I was going to pay that so I bought mine online. I’ve heard that World Market has it at a decent price, so you may want to check there! I’ve also heard that cardamom is expensive in the US. I bought mine in Sweden years ago and everything seems expensive there, so I didn’t notice anything unusual about the price. But I just did some research and it turns out that cardamom is the second most expensive spice in the world, only after saffron. If you don’t have cardamom on hand, you can leave it out. It’s not typically found in lussekatter but like I’ve said before, I toss cardamom into all my Swedish Christmas treats. It just belongs there. This recipe yields 24 buns but you can easily halve it if you don’t need so many. They reheat well in the microwave so you can enjoy these for several days! You can also freeze the baked buns. Have a happy St. Lucia and if you’re not celebrating (which I’m guessing is 99.999% of you ;)) then just have a great Saturday! Mix together the milk, water and saffron threads in a small saucepan over medium heat. Cook, stirring frequently, until the mixture is hot and steamy, but not yet simmering. The mixture should turn quite orangeish yellow. Remove from the heat and stir in the butter. Stir until completely melted. Let cool to between 120 °F and 130 °F (49 - 54 °C) and then add the milk mixture to the dry ingredients, along with the eggs. Use a silicone spatula to stir until well combined. It may be quite dry and crumbly at the beginning but should eventually become wet and smooth. Using a stand mixer fitted with the dough hook, add 1 cup of the remaining white whole wheat flour, 1/4 cup at a time, while mixing at the lowest speed. Fully incorporate the flour before adding more. The dough should still be quite sticky and won't pull away from the sides of the bowl. Knead on low for 5 minutes. The dough will still be a little sticky and won't completely pull away from the sides of the bowl. When you touch it, it should stick to your finger just a little bit. If it's still very sticky, add up to 1/2 cup more flour, a tablespoon at a time, until no longer very sticky. If adding more flour, knead for another 2 minutes on low. Using a silicone spatula, scoop the dough into a lightly oiled mixing bowl and cover the bowl with plastic wrap or a thin tea towel. Punch the dough down. If the dough is still sticky, lightly flour a Silpat or piece of parchment paper. Prepare 2 baking sheets with Silpats or parchment paper. Divide the dough into 24 pieces (40 grams each) and roll each piece into a 7" rope. Form an S-shape and place on the prepared baking sheet. Repeat with the remaining dough, leaving about 3" between each bun as they spread quite a bit. Once they've almost doubled, preheat the oven to 350 °F (175 °C). Brush the egg white mixed with water over the buns and place 2 raisins on each end of the bun. Bake the buns for 8 - 11 minutes or until lightly browned on top. Can be kept at room temperature for up to 5 days. Reheat in the microwave at 50% power for 10 - 20 seconds or until soft. I used refined coconut oil, which has no coconut taste. If you use unrefined coconut oil, these are likely to have a coconut taste to them. I was compensated by Red Star Yeast for the development of this recipe but as always, all opinions expressed in this post are my own. 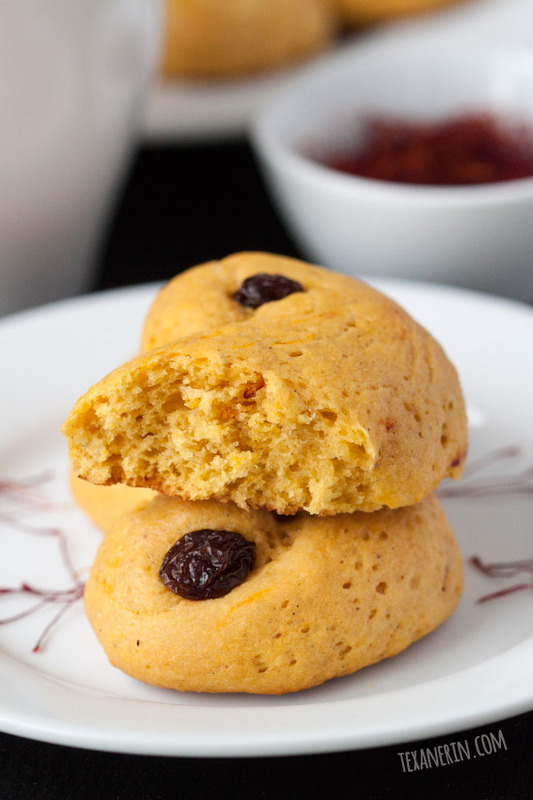 27 comments on “Whole Wheat St. Lucia Saffron Buns” — Add one! If you were to tell people what you think is the best way to veganize this recipe your vegan readers and people, like me, who sometimes stumble upon your website when looking for vegan recipes, would appreciate it and be more likely to make it. It is currently, as far as I know, impossible to find a recipe online for vegan whole-grain St. Lucia buns, so you could maybe grab the whole vegan health-conscious market! I found one for vegan whole-grain saffron buns but they’re shaped like a regular bun and not made with 100% whole-grain. Hello! I can no longer eat wheat so I can’t work on veganizing this recipe. I work very hard to offer vegan and lots of other dietary options in almost all my recipes (although I’m not vegan) but unfortunately it’s not always possible. Sorry about that. I adore the color of saffron in food. Such a beautiful hue. These saffron buns are beautiful and I love the addition of cardamom. I need to try it in something else. This is the only thing I’ve tried it in! I adore anything with cardamom in it! I toss it in all of my Danish treats, as well as some favorite American goodies. I’ve been meaning to try St. Lucia buns! Ooh! Are you Danish? I’m going to go look for Danish recipes on your blog! What a gorgeous recipe! I only use Saffron in a few stews/dishes – love that it’s used in these buns! I’ve never had saffron. It always makes me think of Ratatouille, where he HAS to have it for his dish! I’d love to try it, especially in these buns! Ha! I hadn’t thought of that. :) I hope you get a chance to try it! Such gorgeous cookies!! The Swedes have some of the best Christmas recipes! 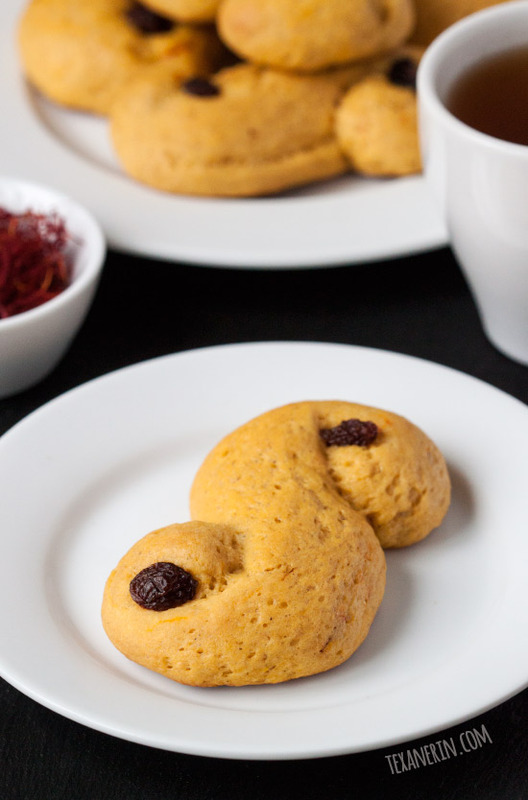 I just so happen to have some Saffron just begging to be made into these buns! Happy celebrating on Saturday! I need to give saffron a try. I have never had it before. Celebrating Lucia tonight with a bunch a Swedish parents and kids here in Berlin. Love the recipe! Saved for next year. Tschüss and hejda! Aww. I’m jealous! I really miss Sweden. :( Did you go to the Swedish Christmas market this year? I go every year, just so I can be around friendly strangers who speak Swedish. And to eat pyttipanna. I hope you had a great Lucia evening! Thanks! And are there other saffron baked goods? I need to look into that!